Youtube SEO is an imporant aspect as Video marketing is becoming an essential factor in Digital Marketing. People usually like and are interested in watching videos. Videos could also help you to sell more products or services. In actual fact, a study done by Cisco anticipated that by 2020, video will take over 80 percent of all consumer internet traffic. As video consumption keeps on increasing, subsequently so does video’s impact on consumer purchases. Nearly half (46 percent) of viewers said that they’ve actually bought a product as a result of watching a branded video on social media, and about a third (32 percent) conveyed that they’ve considered to purchase a product as a result of viewing a video. 81 percent of customers said they presently interact with brands on social media, plus 43 percent say they’ve done so by watching branded social videos. When questioned for their favorite kind of branded content on social networks, many of them picked video as the most popular answer, through 31 percent of respondents selecting it as their number one choice. According to their market share, YouTube is considered to be the second most well-known and popular social media platform. It is also observed that most YouTuber’s are die-hard YouTube viewers. They are regularly watching videos, looking for videos about everything. 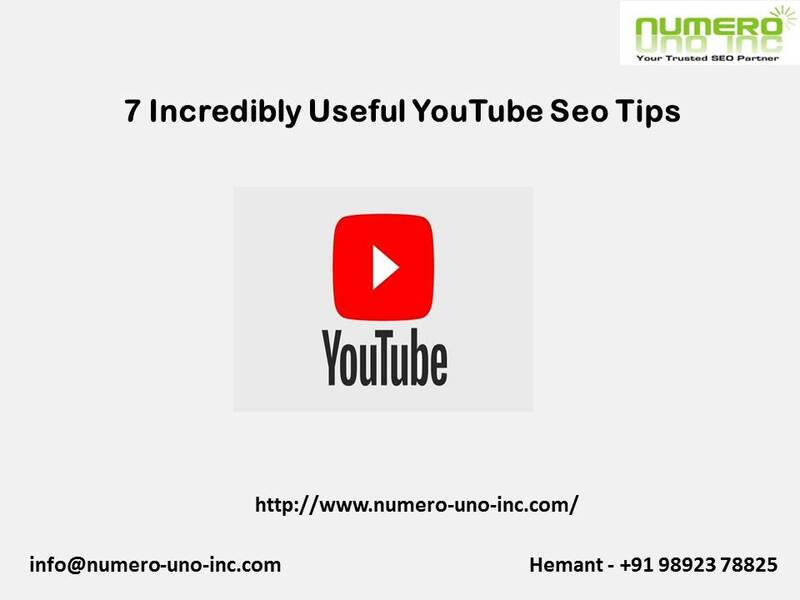 Below are some proven tips listed which will help you to understand how to do youtube SEO and rank your videos higher in search engines as well as help you to gain exposure to your business. Video title is the name for your video through which one can understand what your video is about. Keeping title which perfectly matches with your video content will be very useful to viewer and also to the YouTube algorithm for seo purpose. B) – If the content of your video is regarding something which you think people can search it on YouTube such as music video or live tutorials then you can utilize the YouTube auto complete feature . YouTube and Google are not able to watch or listen to your video. This implies that they completely depend on the text included in the video to understand what your video is about. Learning how to do youtube SEO is fairly an easy task. The more knowledge YouTube has about your video, the more positively it can rank it for your desired keyword. Also note that YouTube makes use of keywords in the description in order to rank you for super-long tail keywords. Name your Video File Before Uploading with Proper Keyword. When doing youtube seo, name your video file before uploading. Your video title helps search engine to effortlessly index your video which in turn also helps it to get higher ranking. 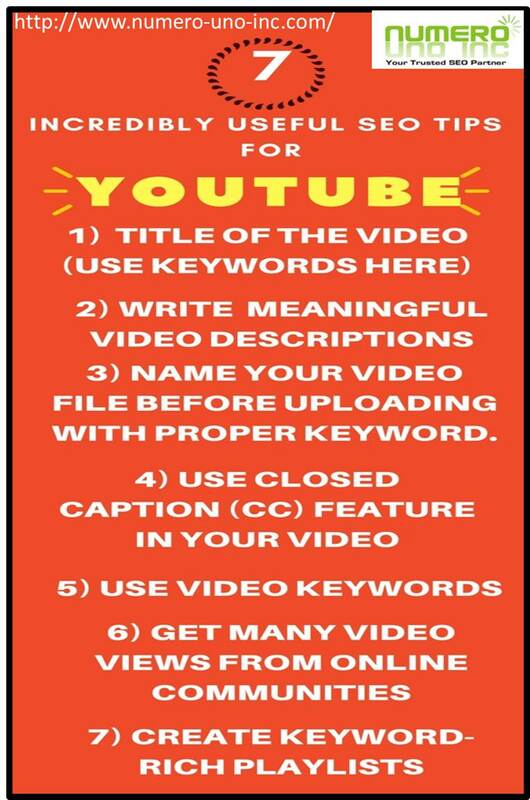 Therefore place your desired keyword as video file name. When you make use of the closed caption feature of YouTube, it will display your text over the video. It benefits viewers to understand your video narration plus can also be interpreted into several different languages, upload transcript of video, in fact transcript comprise the text of what was said into video. YouTube’s new algorithm automatically translate your voice into transcript that makes it simpler to activate it or you could also compose closed caption if your video doesn’t have any voice. Ranking your video in YouTube is good for youtube seo, but also ranking your video in both Google and YouTube is even much better. Even though Google provides YouTube videos an essential advantage in the SERPs, but that’s only accurate for certain keywords only. These keywords are termed “Video Keywords” since they tend to have video results on the first page of Google. Before selecting on a keyword for your video, also make sure to see if there exist any video results on the first page for your keyword. If it is displayed on the first page, then that’s a keyword you should strongly take into consideration. Because there is a huge possibility to get your video ranked in Google as well as YouTube. Quora and LinkedIn groups are examples of Online Communities which are fantastic places to acquire traffic from. In general, almost many communities don’t like people just dropping links to their content all over the place. But they’re typically acceptable to people who share YouTube videos which will be very helpful for them. As the number and quality of your video views is among one of the most significant YouTube ranking factors, receiving views from targeted communities works miracles. Great ways to get more YouTube search traffic towards your videos is by organizing your videos into playlists. A keyword-rich playlist provides in-depth information to YouTube regarding your video’s topic. And as we learned above that with your description, more text-based content equals more views. In conclusion, it depends on you to create compelling and attention-grabbing YouTube videos. Make sure that you ask your audiences to like and share your videos on their most preferred social-networking sites. Hope by now it is clear how to do youtube SEO to rank your videos higher in SERPs. Tip for bloggers is that, insert your videos within blog post, as it will benefit you to get more views. Numero Uno is a leading Youtube SEO firm in Mumbai. We manage your Youtube account to generate maximum views & hence conversion. Kindly contact Hemant at 9892378825 or send us a mail at info@numero-uno-inc.com . This entry was posted in SMM, Social Media Optimization, Youtube SEO and tagged youtube seo, youtube seo tips. Bookmark the permalink. Amazing Blog and very well written. Really great post. I visit your site for the first time and will definitely be back to search more contents like this. Glad that you like the article! Good day, I’m really entertained of your thoughts about this topic! hello there and thank you for your info – I’ve certainly picked up many new points from right here. I’ve learned result-oriented things via your blog site. Glad that you found this blog useful. Glad that you found the blog useful. Awesome! Its in fact amazing paragraph, I have got much clear idea regarding youtube seo from this article. Hello. impressive job. This is a impressive article. Thanks! Great article. I will make sure to bookmark your blog. Hi, Neat post. Very useful points. This is really a very well written article. It is actually a nice and helpful piece of info. I’m glad that you shared this helpful info with us. Please keep us informed like this. Thanks for sharing. Appreciating the time and effort you put into your site and in depth information you offer. It’s nice to come across a blog every once in a while that isn’t the same outdated rehashed information. Wonderful read! I’ve bookmarked your site and I’m including your RSS feeds to my Google account. Thanks a lot for appreciating this blog. Glad that you found it useful ! Glad that you found the article on this blog useful ! One can definitely see your skills within the articles you write. The sector hopes for more passionate writers like you who aren’t afraid to say how they believe. All the time follow your heart. Glad that you found the article useful ! Really Appreciate this update, can I set it up so I receive an alert email whenever there is a fresh article? First of all glad that you found this article useful. And yes you can subscribe to our blog to receive updates regarding new artciles. This is a impressive art6icle. Thanks! Awesome! Its in fact amazing article, I have got much clear idea regarding this topic. I have learn some excellent stuff here. Definitely value bookmarking for revisiting. I wonder how much effort you put to create this kind of magnificent informative site. Hey thanks for your kind words. and yeah happy meal LOL . I’m usually to running a blog and i really recognize your content. The article has actually peaks my interest. I am going to bookmark your site and preserve checking for brand new information. Hey thanks a lot and stay tuned for more great articles !